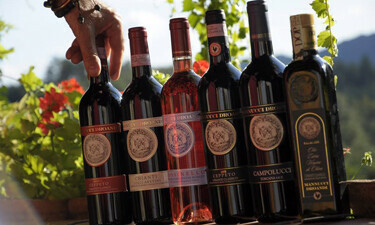 Here’s a private tour for connoisseurs of Tuscany’s prestige wines. We’ll be visiting small boutique estates that are known mainly to aficionados, sommeliers, and of course myself. Super Tuscan wines rank among the best in the world and their reputation is well deserved. However when it comes to the big names, I think we pay more for the fame of the estate, than the liquid in the bottle. Of course others may think differently, but read on to find out what I’m proposing for today’s tour. During the sommelier’s course I did some years ago, my tutors recommended a shortlist of wines they held in very high regard. They were coming from small family estates with limited productions and great commitment to quality. These are the estates’s I’m proposing on this tour. Although not cheap, you’ll find prices are significantly lower than the big names, while offering the same outstanding quality. The blends are based mainly on international grapes such as Cabernet, Syrah and Merlot. Sometimes they also contain percentages of the the native Tuscan grape, Sangiovese. Due to the limited productions, these wines are almost impossible to find in the US, but visitors can have them shipped privately door to door if they wish. However there are no obligations. We’ll visit two wineries during the day and our tastings will be personalized lasting one and half hours. I’ve chosen the best of the best, you won’t be missing out with “only” two I assure you. 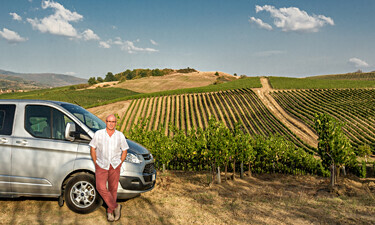 09:15 We leave your accommodation in our private minivan, and travel towards the Tuscany wine region of Chianti. The first part of the morning will be dedicated to enjoying the scenery and taking a few holiday snapshots. Around eleven we arrive at the first estate of the day. It’s a family winery of medium size, with amiable staff who will introduce you to Chianti Classico, an easy dry Rosè based on Sangiovese, and a bold Super Tuscan blend of Merlot, Sangiovese & Cabernet Sauvignon. 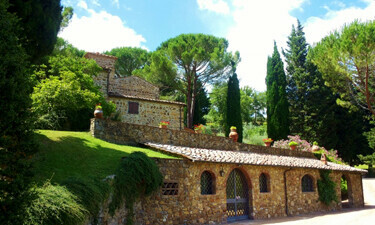 Around one we’ll have a two course Tuscan light lunch in one of my favorite restaurants or a small local winery. Your meal is included in the fee. Our second winery is a boutique estate hidden away on an off beaten track location. We’ll visit the cellars and learn about their infinite dedication to quality. This is perhaps the only winery in the Chianti region that doesn’t produce Chianti. They made the decision not to become part of the appellation and it’s resrtictions in order to only produce Super Tuscans. In keeping with what is expected from a Super Tuscan wine tour, we’ll be tasting blends based on Cabernet, Sangiovese and Merlot. 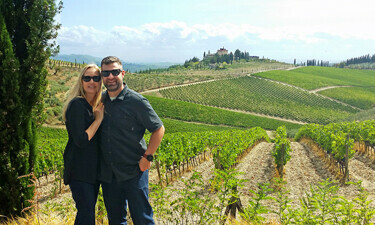 Our Super Tuscan wine tour ends around 4:15pm and we head back to Florence arriving at 5.15pm.